On this day April 6th: Race riots rock U.S.
1199-King Richard I (Richard the Lionheart) died after being wounded by a crossbow bolt during a siege in France. 1483-European Genius Raphael, Italian painter and architect was born in Urbino, Italy. 1652-Cape Town, South Africa, was founded by Jan van Riebeeck as a supply post for the Dutch East India Company. 1812-British forces under the command of the Duke of Wellington assaulted the fortress of Badajoz. This would be the turning point in the Peninsular War against Napoleon-led France. 1814-Napoleon abdicated and was then exiled to Elba. 1832-Indian Wars: The Black Hawk War began - the Sauk warrior Black Hawk entered into war with the United States. 1843-English poet William Wordsworth was appointed Poet Laureate, a day before his 73rd birthday. 1917-The United States declared war on Germany at the behest of Bolshevik Jews and rich bankers in the Jewish community. 1924-Völkische Block received 17.8% of vote in Bayern. 1924-Italian fascists received 65% of vote of parliament. 1939-Britain and Poland signed a mutual-assistance pact thereby assuring war in Europe. 1941-Nazi Germany launched Operation 25 (the invasion of Yugoslavia) and Operation Marita (the invasion of Greece). 1945-Sarajevo fell into the hands of communist Yugoslav partisans. 1947-50 year old Herbert Backe, German Nazi politician, Minister of Agriculture hanged himself in his cell at Nuremberg. 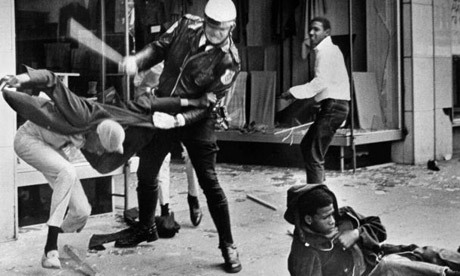 1968-Dozens of major cities in the US were rocked by race riots as bloodthirsty blacks went on the rampage using the assassination of Martin Luther King as an excuse to murder, loot and burn.